They make a powerful symbol in the evening sky: A dimming orb and a curving jet of water, a scene of breathtaking beauty that man has yet to equal with any artificial construction. That simple graceful jet of water is the final glorious result of a very complex piece of engineering. In the manner of the swan, the fountain is all grace and poetry above water level, but working furiously underneath. The fountain that dominates the Jeddah skyline today is the second one built as a landmark for the city, both within the perimeter of the Salam Palace. The first, built between 1980 and 1983, was very much after the style of the freshwater fountain in Lake Geneva and reaches 140 meters (460 ft). It lofts about seven tons of water into the air at any one moment at a nozzle speed of around 200 km/h (124 mph). Thus, the decision was made to build a fountain of singular majesty, one that would reach well over 300 meters. A fountain on such a grand scale presented unique challenges. 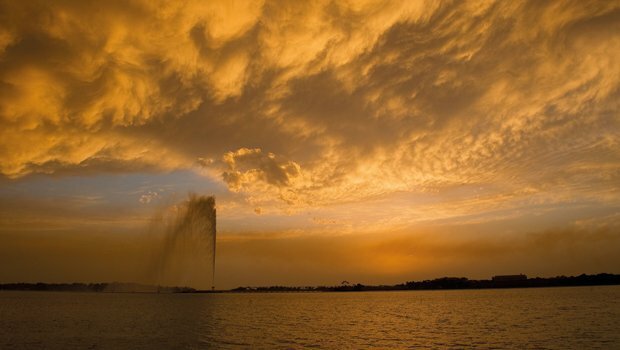 Most fountains use fresh water; the Jeddah fountain uses seawater. The abrasive qualities of salt and suspended particles of sand presented unique problems. Corrosion — a particular threat with salt water — had to be minimized, as frequent replacement of pipes would push maintenance costs upwards. The enormous pumps, power supply and pipe-work had to be positioned as near the jet as possible to counter the resistance built up by the flow of water through the lines and not obtrude into the view of the palace. The theoretical solution was simple; put them under water. Easy to say, but achieving it was far more difficult. The causeway carrying the pipes to the jet and the island it is mounted on was retained. The rest of the support structure was built specifically for the new fountain. The pump room and electrical sub-station buildings were built in Rabigh where SETE was constructing an oil refinery. The completed structures were towed to Jeddah where the seabed had been leveled to receive them. The barge was submerged so that the buildings, which were just buoyant, could be floated off and maneuvered into position, sunk and fixed in their final position. Access corridors were built and once pumped dry, the buildings were fitted out. The main pump house accommodates three huge centrifugal pumps and 18 auxiliary pumps for cooling, lubrication of the main pumps and drainage. Each of the 3.50 MW pumps delivers 625 liters of seawater per second. Two of the three pumps installed power the water jet and deliver 1,250 liter of water per second. The third is available as backup. Sulzer made the huge pumps in Switzerland and builders come yearly to check and service them. After nearly thirty years, the machines are in immaculate condition in their clinically clean engine room. The job of building this unique fountain kept one of the most intriguing challenges right to the end of the line. The water leaves the nozzles at 42-bar (609.16 psi) and at the incredible speed of 375 km/h. The plume hangs in the air for 15 seconds or so and weighs in excess of 18 tons (18,750 kg). There was industrial experience of seawater fountains — but not at the water velocity, pressure and height specifications of the Jeddah fountain. Every month, the nozzles had to be replaced. SETE engineering set to work and developed a special alloy, tough enough to allow the nozzles to last for years. Even the lighting of the enormous plume presented challenges. Five hundred high intensity spotlights mounted on five custom-built islands illuminate the jet. The technology of overcoming corrosion by seawater was well known. What also had to be tackled — and was — were the effects of the battering given to them by thousands of tons of water an hour falling on them from several hundred feet. The elegance and simplicity of the plume high above the pump room belies the maintenance and care given to the machinery that produces it. The whole operation is computer controlled and has a comprehensive maintenance system. Ten technicians are dedicated fulltime to the fountain’s operation, including rotating specialists and electricians. In addition there is continuous support from the departments responsible for the operation and maintenance. The other reason is less obvious. If the prevailing northern wind reverses direction and blows from the south, the curtain of spray from the plume would carry into the gardens of the Salam Palace and kill the grass and plants. This finally puts to rest the myth that the fountain jets fresh water. The only fresh water in the entire self-contained fountain complex is for cooling the electric motors of the main pumps and for the air-conditioning in the pump-house. It was a fitting tribute to the modesty of the designers and engineers who created the fountain that their focus on overcoming the challenges and their insistence had been on “getting it right”. For nearly twenty years they overlooked what to most people would have been almost their first question about the fountain. Towering over Jeddah at — on a calm day — a majestic 312 meters (1,023.62 feet), Antonopoulos and Benissis confirmed that the fountain was the world’s tallest seawater fountain. The plume is taller than the Eiffel Tower, which stands 300.51 meters (986 feet high. So next time you look at the gauzy pink veil of water trailing in the evening breeze with a billion shimmering droplets with the ruddy glow of the dying sun, and the muse beckons you to poetic thoughts about the eternal cycle of our fragile existence, just remember two things: You are looking at a modestly unclaimed world record. And it was engineers, not poets who put it there.